We are back in Whiskey with the Collins’, this time it’s youngest of the brothers turn. Fox Collins, hot owner and editor of the town newspaper the Whiskey Chronicles. Ladies this man is the total package; smart, funny, a business owner, and did I mention he is hot!!! Melody Waters Whiskey’s is newest resident and she may have met Fox a few months before moving to town and they shared one hot night together. She has moved to town for two reasons, to help her aging grandmother and to start a new chapter in her life by becoming a business and owner herself. I love being back with the Colllins clan, seeing the family is great. Fox really is into Melody and she is into him, but all she thinks she can afford to be right now is friends. She also doesn’t think she deserves more because of her past, a past that she really doesn’t want to explain just yet. Seeing these two characters building their relationship is so sweet. I adore Melody’s grandmother, with whom Fox is interviews for a article in the paper. She has done so much in her life and is one of the town’s most notorious residents. LOL!!! 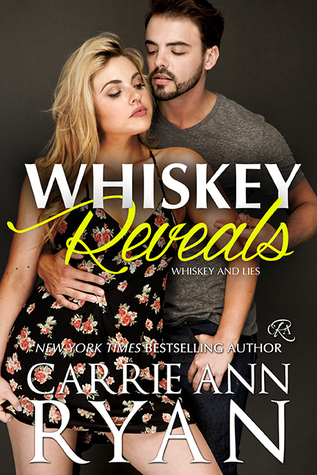 Of course it wouldn’t be a Carrie Ann Ryan story if she didn’t give us a little mystery and boy does she give us a big one in the form of a stalker, someone from her past is out to get Melody. Ryan has done it once again writing a witty, heartwarming love story full of family, fun, a strong woman and man, with a dash of mystery. I can’t wait for more from the Collins family!! !